Thus far during our travels Pam and I have been extremely fortunate with weather conditions. In my mind it is almost like sunshine is following in our footsteps. Of course there have been periods of rain and grey skies however a short revisit of our photos posted in our blog entries shows mostly one deep blue sky day after another. During our time in Croatia and Montenegro we have paid little attention to the world at large. Disastrous conditions like the heat waves and bushfires in Australia or the long and freezing winter in the USA have washed over our little cocoon of blissful ignorance. That the UK has been suffering the wettest winter in 250 years has almost completely bypassed our attention. During conversations with Paul and Mavis prior to their departure Paul expressed his dissatisfaction with the terms Global Warming or Climate Change. ‘It should be called Global Climate Weirding’ he growls on a couple of occasions. Now we are living in the middle of the weirding on a Southwest facing slope on a windswept island. Luckily we have thick stone walls wrapped around us, an AGA warming the kitchen, central heating and a working fireplace in the living room. We are hardly doing it tough. The long list of tradespeople coming to do repairs is all happening early in the first week. 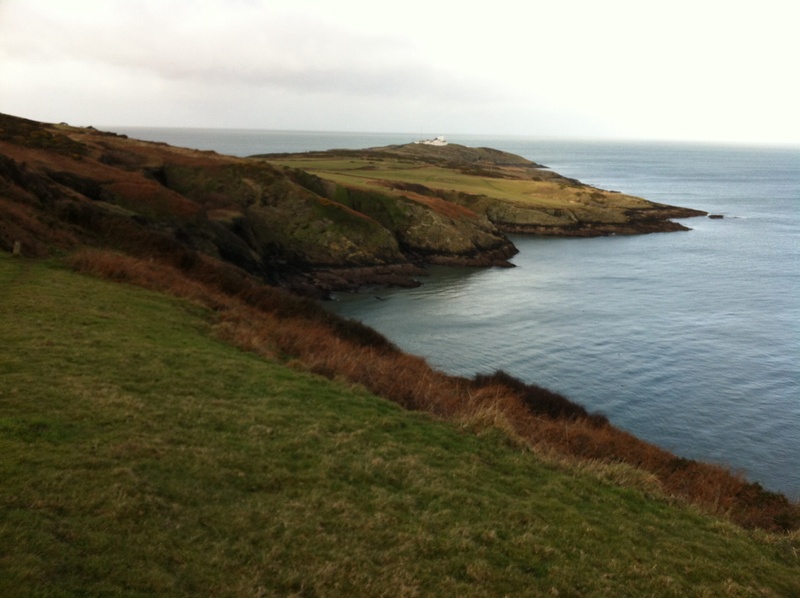 We decide to leave our goals of walks and exploration of the island for later and settle into the slow rhythm of Deri Fawr. For me there is a daily morning and afternoon cycle of maintaining the ducks. Pam is in charge of egg cleaning and sales. We are sold out of eggs by the end of day one. It hails twice in the afternoon yet the late afternoon finds the sun setting in a clear sky. On Monday of the first week the special wide fitting hiking boots that we had ordered online during the US Black Friday sales while we were in Split, Croatia arrive. These boots have now travelled from the US to Aus to the UK. Completely unexpected postal and customs fees in the UK have made these by far the most expensive pair of footwear I have ever owned and I have not even tried them on. The 30% discount on the original purchase price during the online sale has been well and truly swallowed then regurgitated with extra costs seemingly added just for the hell of it, just for the smell of it. Pam is threatening me with all manner of heinous punishments should the small fortune we have spent on procuring them be in vain. The moment arrives, I gingerly pull them on, they are snug yet thankfully they fit well as long as I loosen the laces completely around the ball section of my seemingly ridiculously wide foot. WHEW…..looks like I live to walk another day. My grandfather used to gleefully tell me ‘Mick, you have a great grip on Australia’. I am definitely a couple of standard deviations beyond the norm on the bell curve of foot width. Until the WiFi repairers arrive later in the week we suffer from withdrawal from the online world we now seemingly cannot do without. Mornings are often fine, we wake to blue skies, by 9:00 am clouds are racing across the sky, by 10:00 am it is pouring and sometimes hailing. Incessant wind sheets rainfall horizontal. Other than short shopping trips we have stayed mostly within the house for the first few days. Pam is climbing the walls. It is becoming obvious to us both that we are going to have to seize whatever short gaps that occur in the atrocious weather and just make a break for it in order to take in the sights of this beautiful island. The remainder of this blog entry will follow this pattern. Every morning I attend to the ducks and wild birds regardless of the howling winds and horizontal rain. Should the weather allow it we scamper out and about. By four pm we must return to rehouse and feed the ducks. 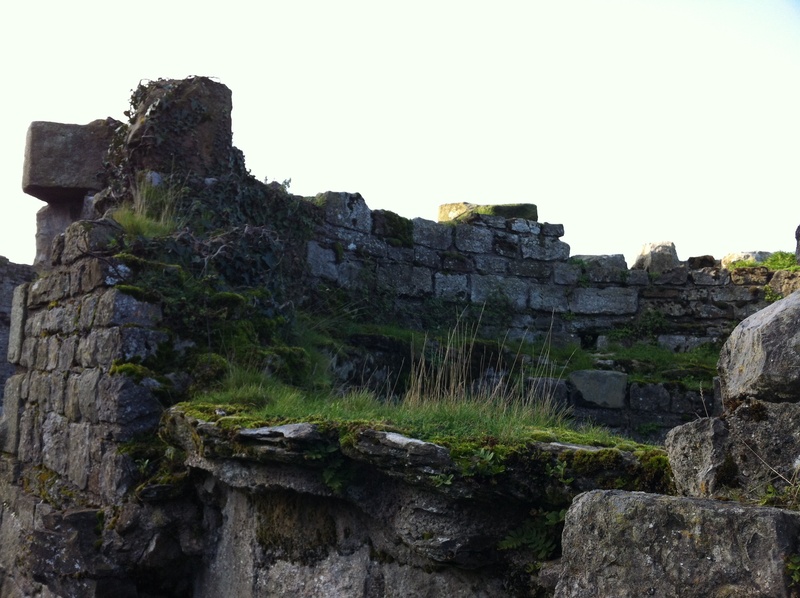 What follows is the heart of our little journeys outside the gates of Deri Fawr. Day after day of very bad weather between these outings have us holed up ensconced in the warmth within the stone walls that Pam seems always frantic to escape. Pam can take it no more, the day is far from fine however it is only kind of spitting occasionally, we are heading out and about for real for the first time. 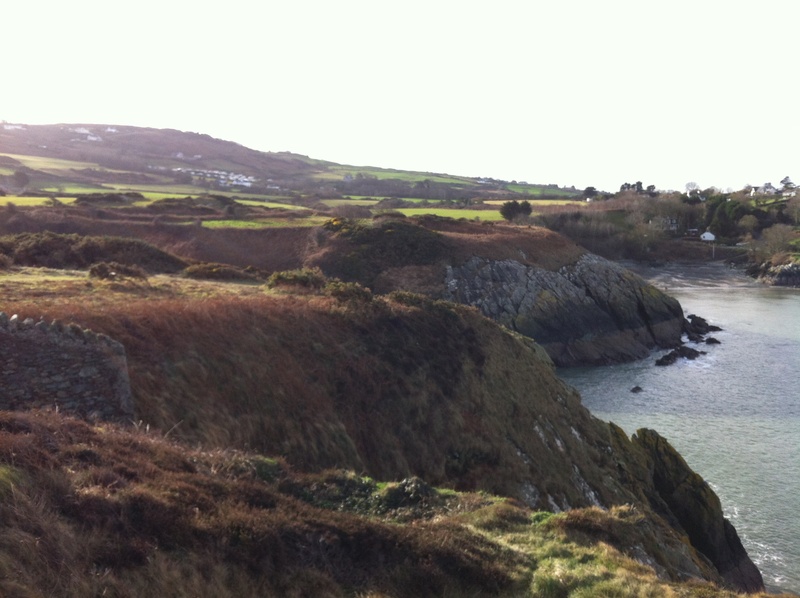 On our short drives so far in Anglesey we have passed many little areas that shimmer with an aura of sheer beauty. Almost everywhere on this green island is picture postcard worthy. These small radiant glades harbour the island’s essence concentrated to the Nth degree. The winding hedge sided roads that we follow today take us past yet another such area however by now it is raining again. We vow to return to attempt to capture it digitally. Around us the countryside flashes by. Time moves slowly here, fences have roots and branches rather than barbs and wires. Half an hour or so later we are driving through Holyhead which is the largest town in the county of Anglesey in spite of the fact that it is located on Holy Island which is separated from the Isle of Anglesey by the very narrow Afon Crigyll strait. 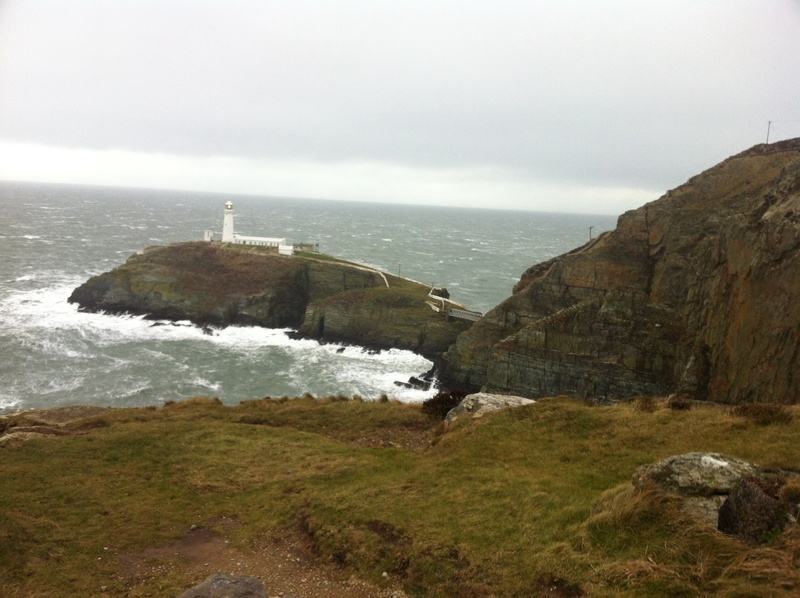 South Stack is a craggy windswept area where a lighthouse does its best to ward passing ships round the most Western part of Holy Island and Anglesey county. 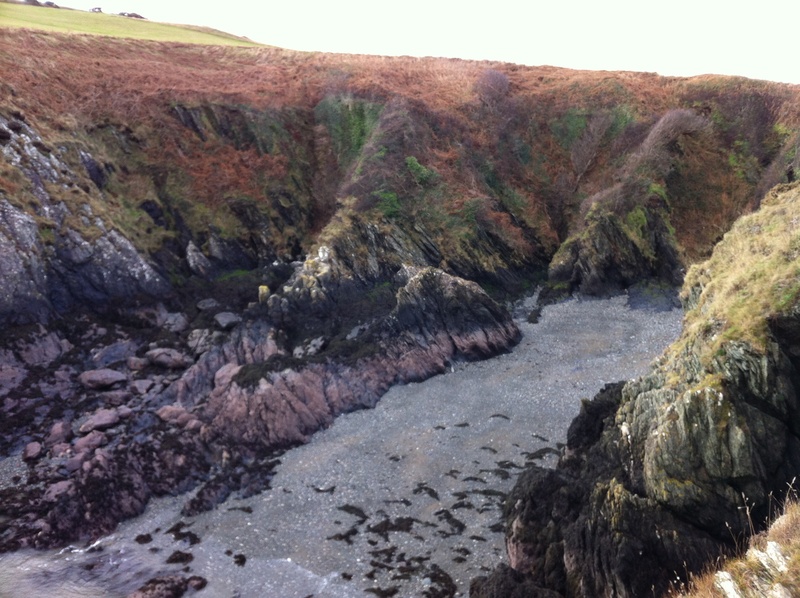 Paul had detailed some of the many ships that have been wrecked on the rocks and cliffs surrounding Anglesey and I am sure that the waters here still wash over the bones of long lost sailors. As we pull into the gravel parking lot of the cafe at the boundary of the nature reserve that surrounds the lighthouse rain begins to fall lightly once again. We elect to have lunch in the cafe and decide what to do from there. 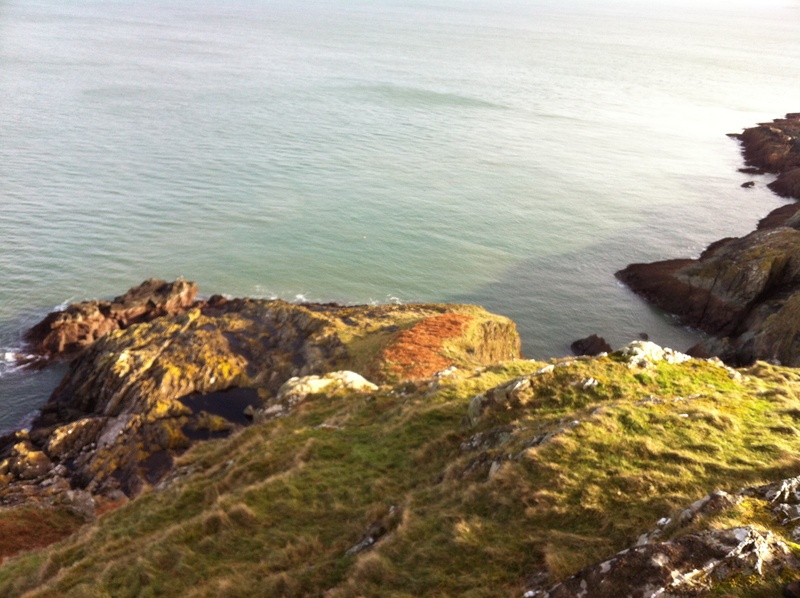 Large windows allow a great view of the Irish Sea that lies beyond the nearby cliff edges. Clouds racing across the sky drop wind driven squalls of rain onto roiling grey and white foaming waves. As we eat, tiny patches of blue sky appear between squalls. A group of walkers make their way down the path and stairs that lead to the cliffs. Pam and I gently mock their ensembles which seem more suited for a visit to the North Pole than a gentle walk down to a lighthouse. We decide to risk the ever present inclemency and time our run between squalls that can be clearly seen rushing across the swirling waves. 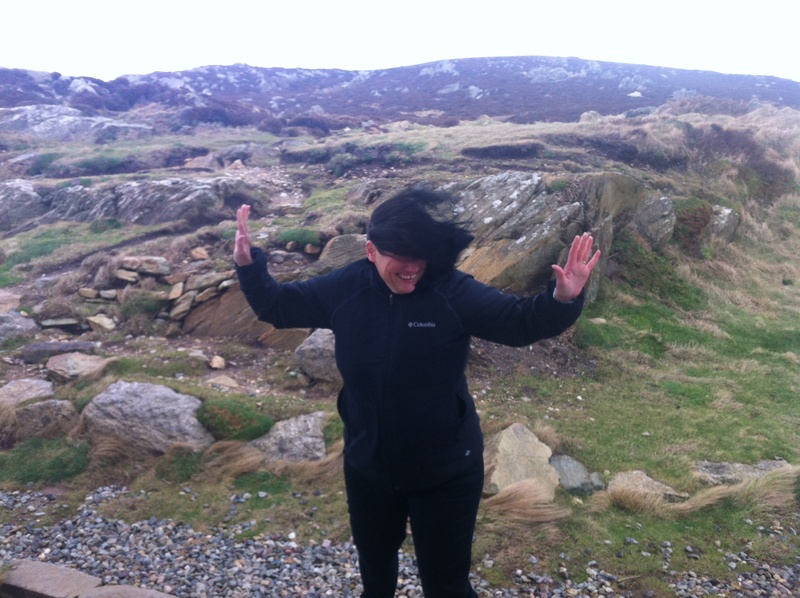 The moment my foot finds the first stone stair the wind speed increases dramatically. Unfamiliar with the feel of my new boots I stumble and nearly fall. Pacerpoles come to my rescue once again. Pam is climbing down ahead of me oblivious. Raging winds drag my calls for support streaming from my lips and wraps them silent in my wake. There will be no verbal communication and it is too late to learn naval semaphore. 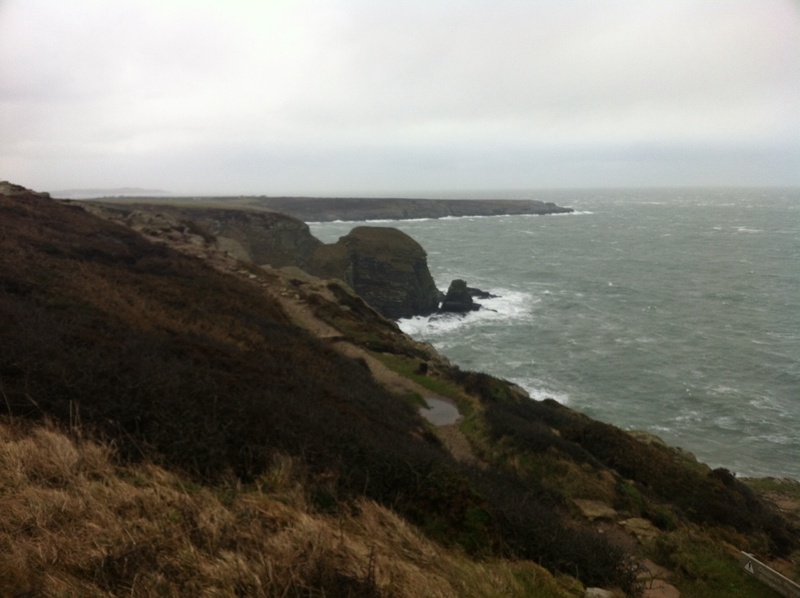 Wind speed is increasing with each step, Pam turns back where the path diverges near the cliff face. 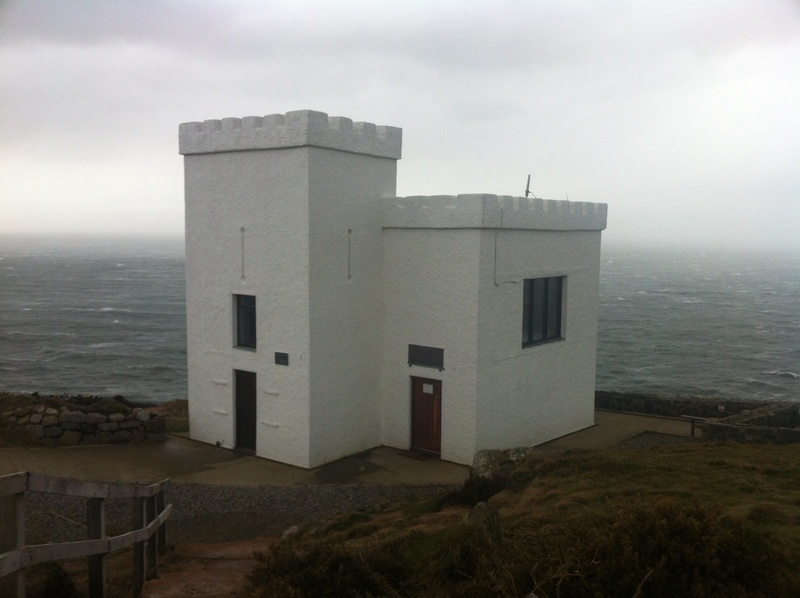 ‘Shall we go to the building in front of us or towards the lighthouse’ she screams into the now howling gale. By now we are standing in the fastest wind either of us have ever been in. Pam is obviously freezing and even my fingers are becoming painful. My remorse filled apology for mocking the rugged up people we had spied from the cafe has us laughing like a couple of crazies in the wild conditions. ‘Lets make it to the lee of that building and regroup’ I shout. Crossing the threshold between gale and lee has us both stumbling after losing the support of the rushing wind we had been leaning into. We huddle in a corner of the white blocky building walls. Pam had mocked me filling my day pack with all our cold weather gear before we left Deri Fawr and I return the favour as she scrambles to drag it from the bag. Once we have put on every stitch of clothing I have brought we brave the winds once more. Pam finds she needs to tie her warmy hat down with her scarf to prevent it being sucked from her head into the sky. Water falling down the cliffs mixes with salt ocean spray and blows back thin as steam over the crevice between the juncture of cliff faces as we climb back to the car park. 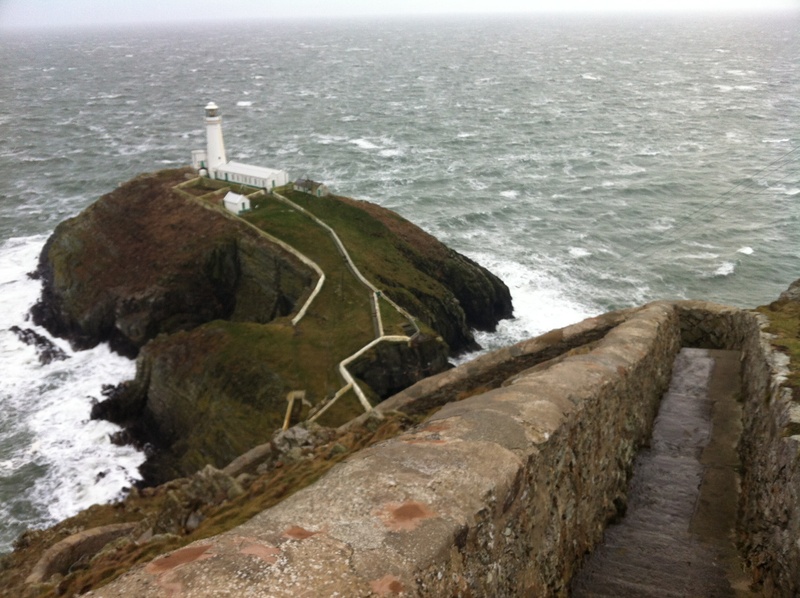 Rather than risking to walk the cliff edge path to the lighthouse in the treacherous conditions we elect to follow the road that leads to the same destination. This is the first real walk I have taken in my new boots, the soles are much stiffer than I am used to. I realise that the now badly diagonally worn left heel of my old boots has been contributing to my constant knee pain for my gait is much improved. The lighthouse is not accessible to the public at this time of year and we only walk a little way down towards the 400 stairs that descend to the metal bridge crossing to the small island supporting the lighthouse. Looking up I see a stone shelter at the top of the rocky hill. ‘Lets climb up’ I say to my by now none too keen wife. Wind speed is increasing steadily, we both come close to stumbling as we climb the rocky path as gusts make balance very difficult each time we lift a foot. By the time we reach the crest the wind is so strong we need to hang onto the walls of the stone shelter to make it from the lee at the rear to the front. I pull myself inside and put out a hand to drag Pam in with me. Inside the open shelter the gale is rushing in a tiny cyclone so strong it has created a steep sided whirlpool in the water lying on the floor. I am glad of my new supposedly completely watertight boots. Photography has been very difficult the whole time due to the wind grabbing at my arms and in the swirling cramped interior of the stone shelter I struggle to take shots of the lighthouse and crashing waves below. Suddenly the wind speed lifts dramatically yet again, Pam is getting frightened and tugs at my arm to leave. Luckily as long as she can maintain a firm grip on me she is very unlikely to be blown away. Balance descending is even more difficult than ascending, Pam is hanging onto rocks, I am hanging onto my Pacerpoles. Gusting winds dislodge each footfall’s aim. I gain a new respect for mountain climbers along with Arctic and Antarctic explorers. Horizontal rain greets our return to the safe haven of the road. Our hilarious little day trip is done. Marching to eternity will no longer suffice as suitable torture for my rapidly aging body. During the confines of the first week in Anglesey Pam has the bright idea that CAMPING during the five hundred kilometer Lycian Way in Turkey will form the ideal bulk of our accommodation. The woman is mad, yet unstoppable in her determination. She possesses relentless skills of persuasion finely honed by two decades of sales rep experience. I am no match for her. After my pitiful show of resistance has been swiftly overcome I am assigned the task of researching suitable tents on Paul and Mavis’s computer while we wait for the WiFi techs to arrive later in the week. It would seem most things in life boil down to a compromise, none more so than choosing a tent. Do we go for the ridiculously expensive and tiny ultralight weight options to save weight, will a tarp strung between upturned Pacerpoles suffice. Popup tents only collapse down to a wind catching circle that I would have to hump around on the exterior of my backpack. What about the extra weight? Pam insists on a groundsheet and protected entry foyer for our packs, I am 190cm tall. Reviews on two man tents all say to avoid them unless you are single or both child sized. We are definitely not paying the ridiculous outrageously expensive UK customs charges for anything purchased outside the country again. It takes me hours of research however finally I make a choice. We are going to buy a Vango Tempest 3 Man tent. A bricks and mortar store in Chester which is about an hour or so drive from us has them on sale at the best price I can find. Pam insists we go as soon as I have made a decision, she doesn’t want me second guessing myself in my usual manner. Chester is a town that lies slightly inland about halfway between Anglesey and Manchester. I make up a song that I sing incessantly the whole way to annoy Pam. Tiny amusements fill tiny minds. As we enter the store I am under strict instructions. We have a small list of items such as a headlamp,water treatment pills and nubuck leather treatment for my new boots to go with the tent and I am not to spend hours wandering the store in search of random special needs items. We have abandoned thoughts of cookers or gas rings during our drive to the store. We will eat raw or not at all in Turkey. 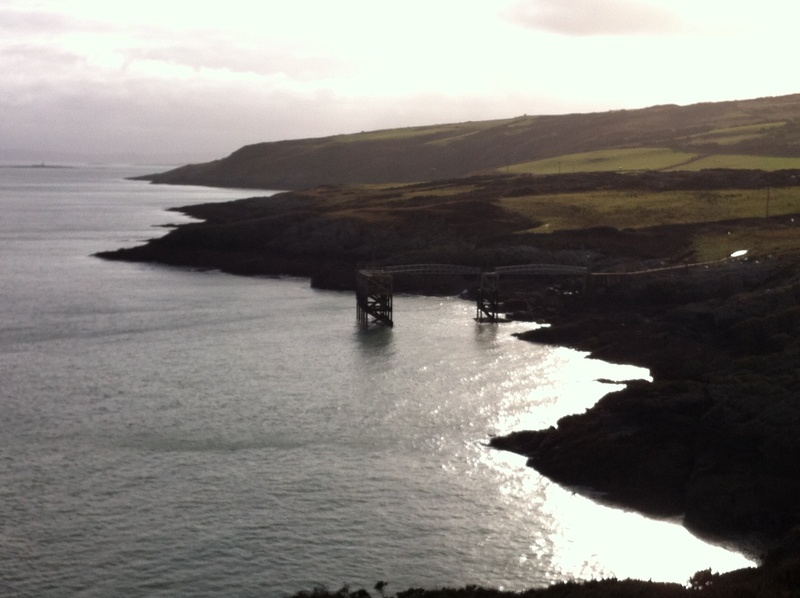 Our needs are swiftly met and we are back on the highway returning to Anglesey in no time. This is the longest period I have worn my new Lowa Tibet GTX Wide Fit boots without walking since their arrival. These are serious high end heavy load hiking boots that have a rubber rand encircling the entire lower shoe. This rand means the shoe width offers none of the usual natural expansion in leather that I have used in the past to make shoes eventually fit my gargantuan feet. I have done the laces up too tightly leaving in the morning and on our return a stabbing pain of confinement begins coursing through the width of my feet. Pam is muttering threats of vile repercussion as I pull into the emergency stop to loosen the laces. Sighing sweet relief our return continues unimpeded. Back in Deri Fawr I add another three and a half kilos to my backpack. 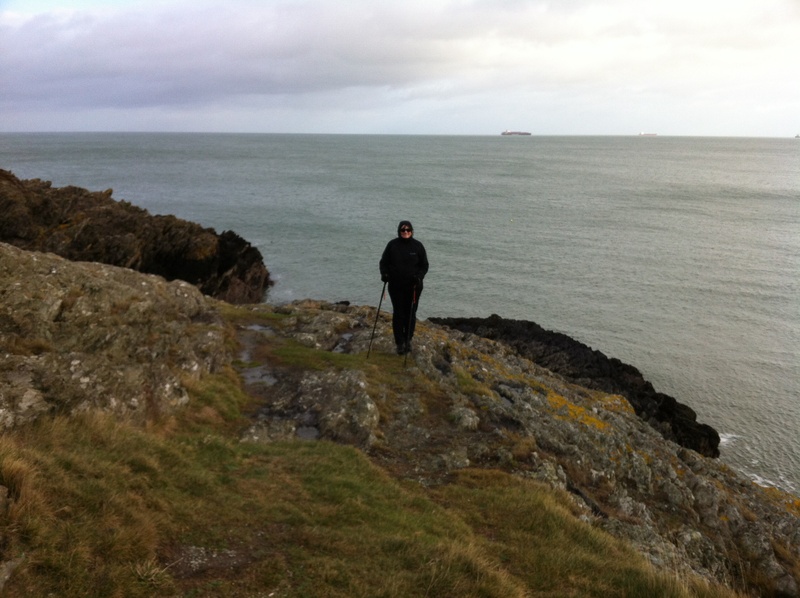 Having listened to our blissfully ignorant statements of intent to walk kilometers every day during our Anglesey stay Paul had graciously highlighted the most scenic areas of the long Anglesey Coastal Walk that traces the circumference of the island. 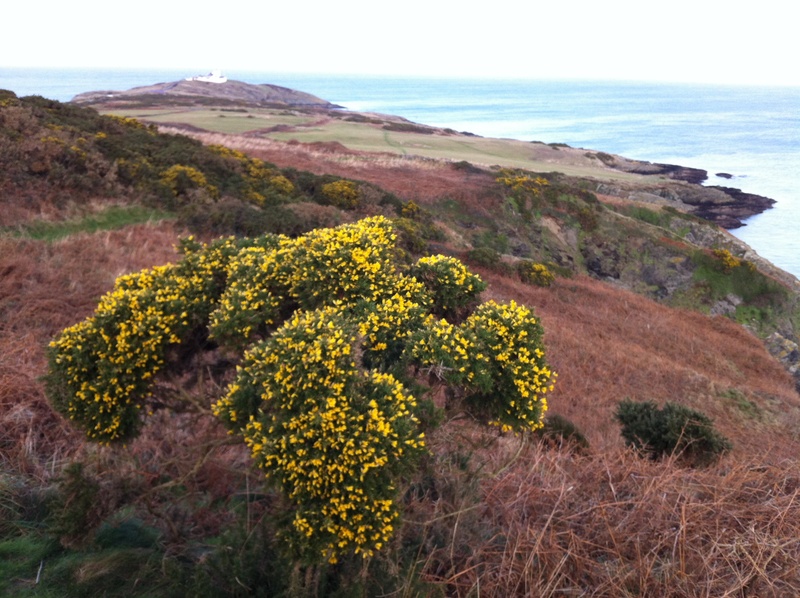 We select one of the walks near the most Northern parts of Anglesea which will take us to the lighthouse at Porth Eilian, a now unused port near the village Llaneilian. 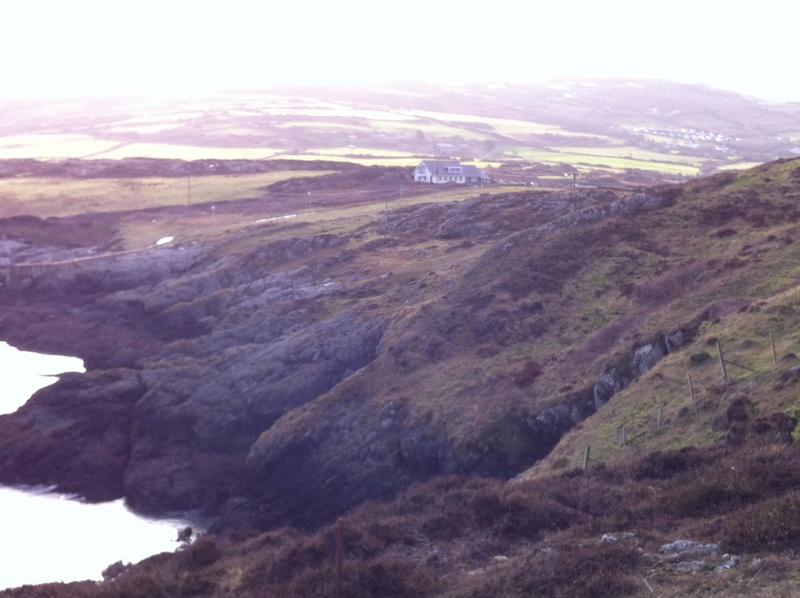 We leave the main road and pass through the village Amlwch and then Llaneilian. Paul has marked a spot to park the car and begin our walk on the map however we are way to unfamiliar with the narrow back roads to find it. Parking beside the small roundabout that lies at the end of the stone and sand cove of Porth Eilian seems to be an acceptable alternative. Other people walking their dogs have also parked here. A mother and daughter couple in wellingtons with a mud covered dog return to their car as we set out along the bitumen road that leads to the lighthouse. 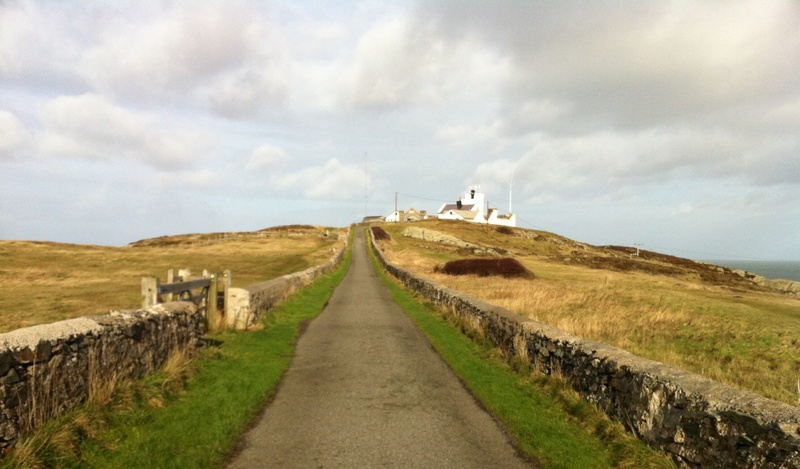 This road is blocked to traffic other than that servicing the lighthouse. Cattle grids seal sections between the stone side walls from inquisitive domestic herbivores. Between 1768 and 1815 Porth Eilian was the site of the worlds largest copper mine and was the most important port in Wales. During the height of the British Empire an astonishing proportion of global sea trade passed through the port of Liverpool. Huge numbers of pilot teams to man the six oared pilot boats were stationed in this area. 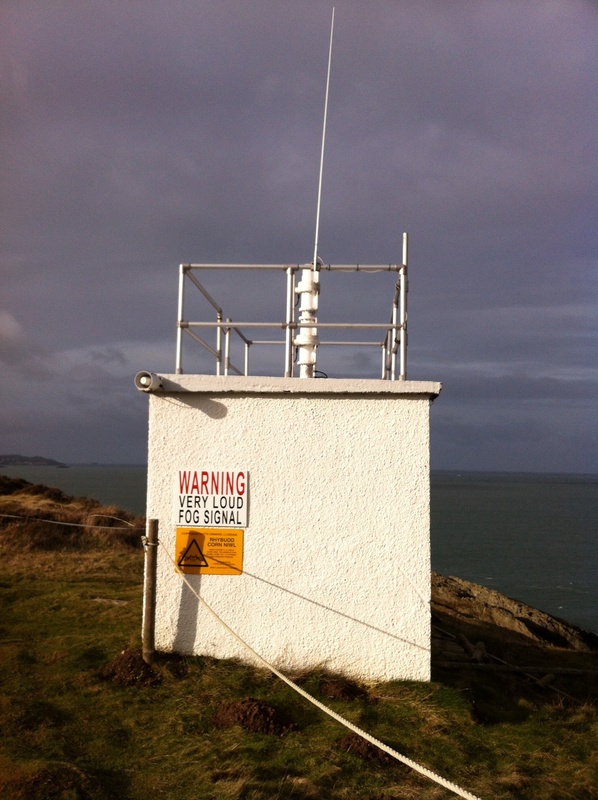 Since 1779 a lighthouse has stood on Point Lynas. 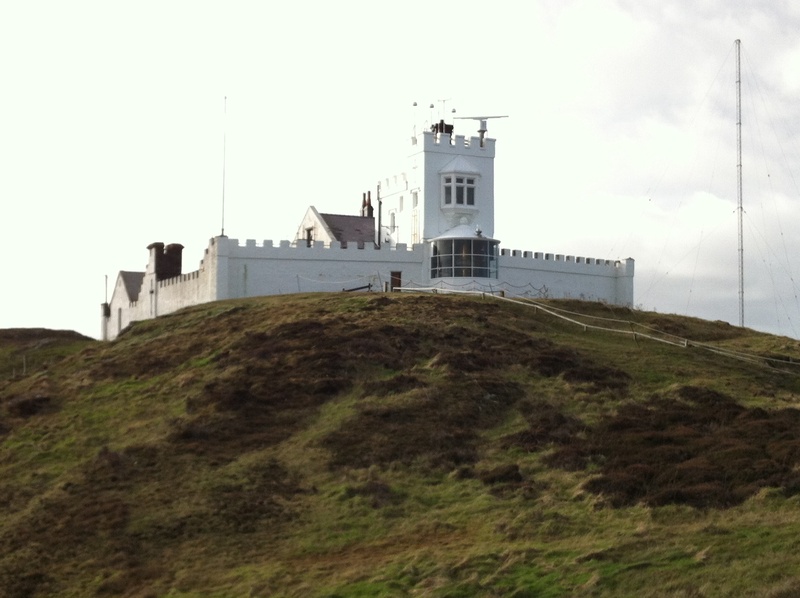 Today the lighthouse flashes every ten seconds and in foggy weather a fog horn sounds with the same frequency. Strolling along the road to the lighthouse the port is to our left and to our right green fields climb the slope of a long hill. 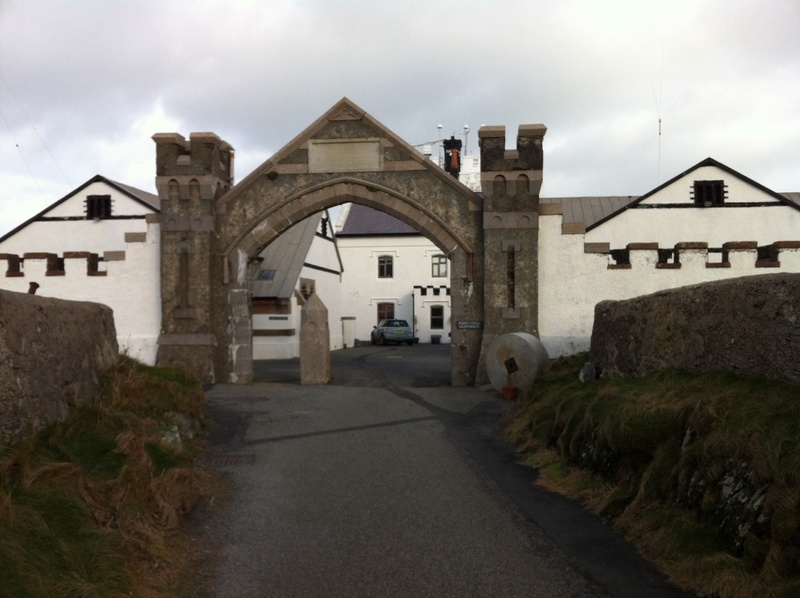 We reach the lighthouse grounds and enter the arched gate that forms the one entry to the walled lighthouse grounds. The white washed buildings are pretty and historic however we are here for marching. 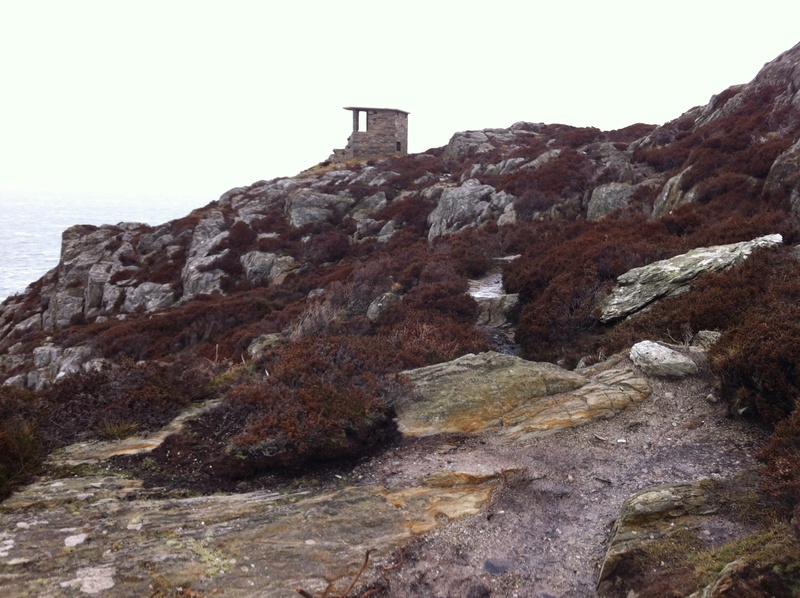 Paths lead around the walls taking us to the foghorn and the tip Point Lynas beyond. 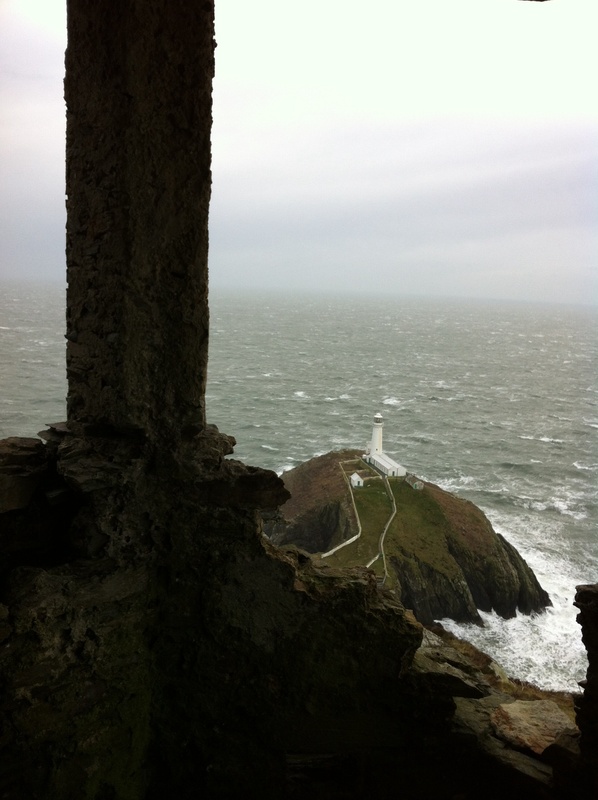 Wind is moving our hair about however after our experience at South Stack I describe most winds as mild. Making our way back to the lighthouse we discuss where to go next and decide to walk down to the rusting jetty we have seen in the bay of the coastline on the other side of the lighthouse. 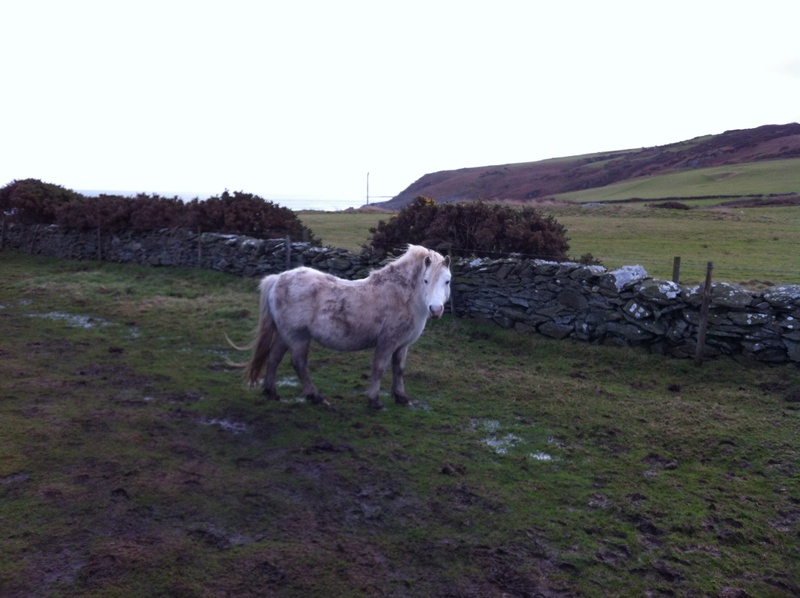 We pass a couple of grazing horses and spend some time clambering about the lichen covered rocks never the jetty. Green fields following the contours of the rocky cliff edges beyond beckon us onwards and ever upwards. The path we follow is wet and narrow. 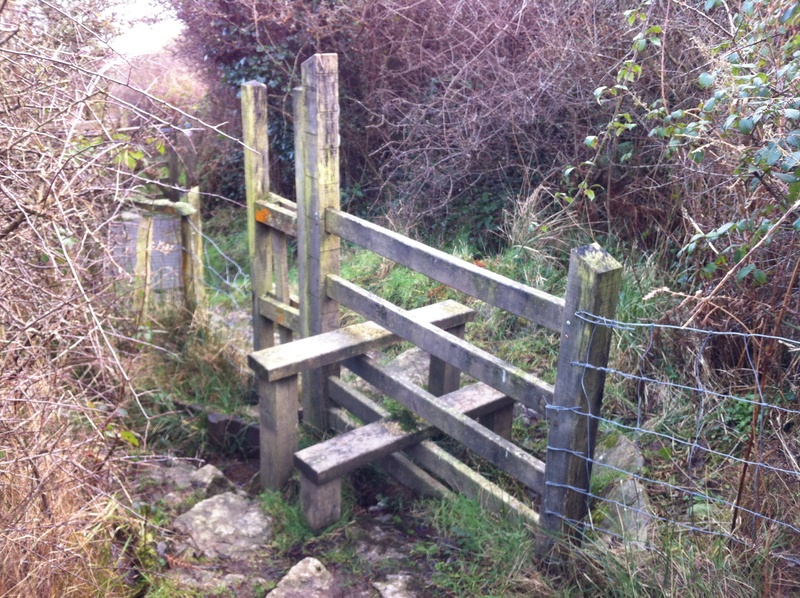 We make our way through swinging stile gates in the stone and hedge fences and leave deep footprints in the lush green fields. Beyond a small stone lined inlet a yellow fishing boat is performing strange maneuvers, reversing in circles, coming forwards only to reverse again. We climb onwards, the cliff faces to our left have reached a height that is beginning to make me worried about the slippery slope we tread above them. Our path diverts from the cliff edge and we tread a muddy trail between yellow flowering bushes. A rocky algae covered outcrop with water flowing over it brings us to a halt. Time to put my new boots heavy tread to the test, I take a tentative step, then another. Jettisoning my Pacerpole grips to each side I turn my face to my left as my feet slide from under me and catch myself in a perfect ground engagement position. ‘Big man down’ Pam cries out in hysterical delight at my misfortune before correcting herself ‘are you alright’? My martial arts instructor from days of old would be proud, my face is almost mud free as I struggle to regain my stance on the far side of the puddle. Pam has the effrontery to insist I assist her traversal of this treacherous ground after her freely offered mockery of my plight. Lucky for her I am not a grudge bearer. We crest the ridge we have been climbing and pass a fence traversing the downwards slope via a wooden stile we have to climb over. I had read many tales in my youth written in England that involved stiles and now I have seen my first one close up. Not sure what all the fuss is about really. Continuing along the cliff face we come to a pocket of rocks, cliffs and sunshine that radiates the ethereal beauty I have commented on previously. 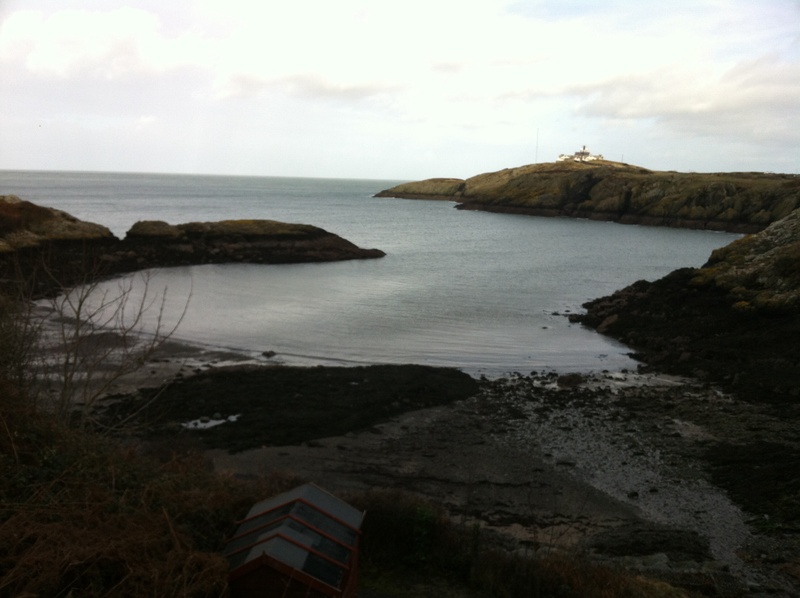 Bring yourself to Anglesey some day, the artificial lens does not suffice. Perching on the rocks above the sea in this magical place we pause for a long while to let the radiance permeate our beings. Pam’s rapidly cooling body temperature forces a decision to divert from the cliffs and climb the hill to our right to try to find a new path back to our car. 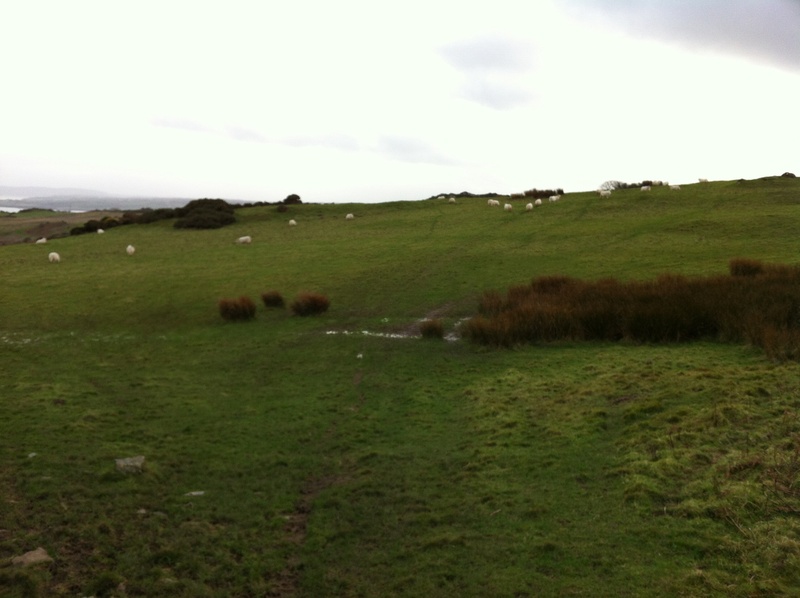 Fields of dense green hide the waterlogged soft ground below. I am happy to report the waterproof claims of my new boots are 100% accurate. Pam’s feet on the other hand are soaked through. Flocks of sheep scatter ahead of us as we climb. Beyond the fields over the hilltop we climb a stone stile to the narrow lane beyond. From the maps we are carrying I work out that we have ironically arrived at the exact spot Paul recommended we commence the walk from. We wander the winding lane between stone walls and hedges over the top of another hill and turn right along one of the many walking paths indicated on the map of the area. 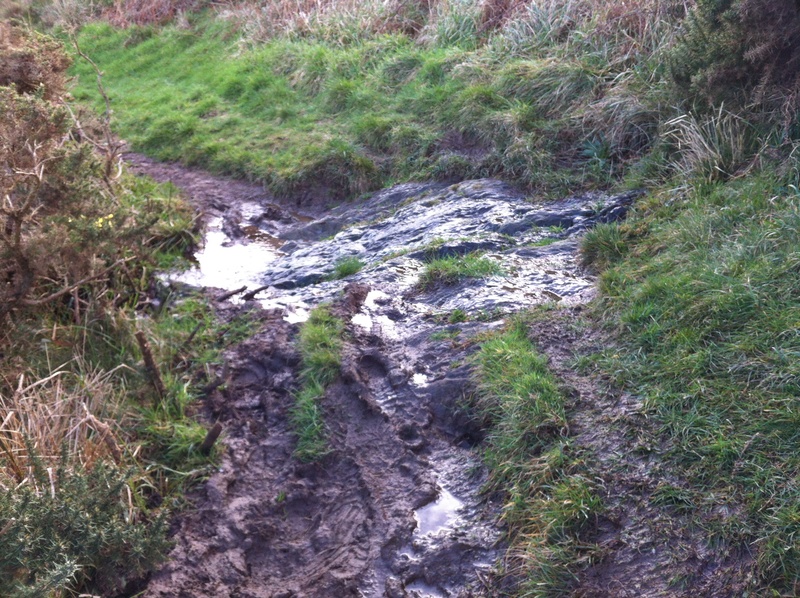 Many slippery mud covered stoney patches line the path ahead. I take each step with care and use my Pacerpoles to full effect. Pam has half a dozen close calls on the slippery descent however allows me no opportunity for muddy mocking revenge. We climb stone stiles that test the flexibility limits of my singing knees. By the time we rejoin the bitumen close to the roundabout where we have parked the car we are both a sight. Stuffing our mud covered boots into shopping bags to protect the upholstery of the brand new hire car we are driving I realise that taking off my boots is just not going to be enough. A short street striptease later I clamber into the drivers seat in my jocks and T-Shirt. There have been several blue sky dawning mornings that have turned grey and raining by the time I release the enthusiastic quacking decad of the Jemima’s into the day. The next fine morning that lasts beyond this early hour finds Pam plotting an itinerary. 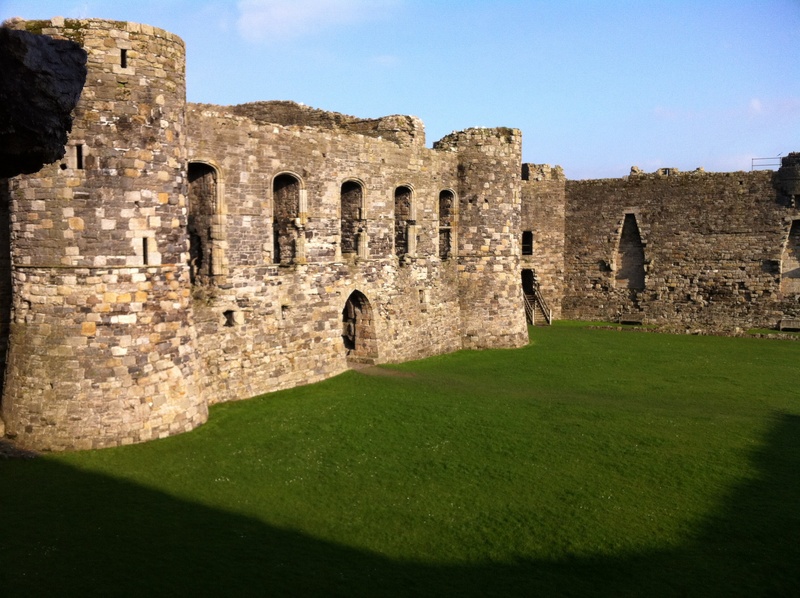 When I return from my morning duties I discover that we are planning a trip to Beaumaris to visit the Beaumaris Castle. Google maps being our ever helpful guide, we now have a charger for the iphone in the car. We turn left from the main road we have now driven many times to Bangor at the village of Pentraeth and follow an extremely picturesque country road over hill and dale. 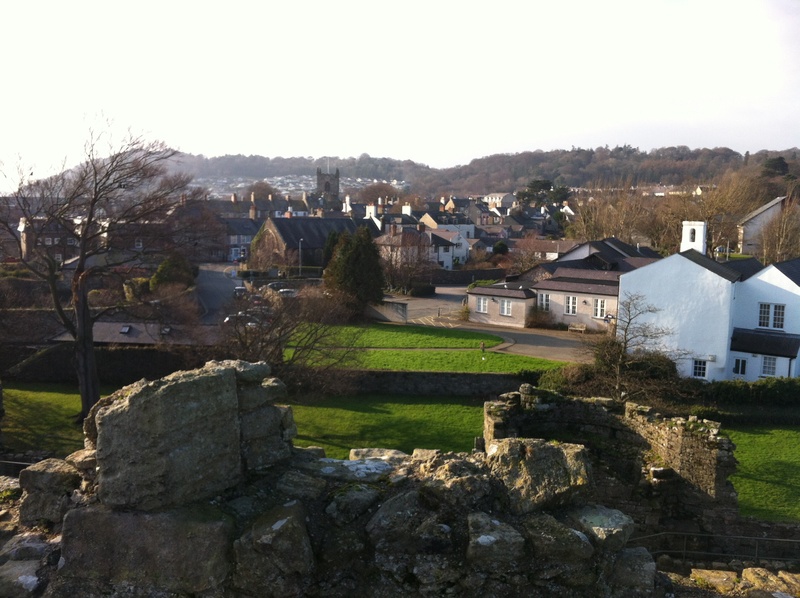 Beaumaris turns out to be a little town built beside the Menai Strait relatively close to Penmon which is the most Eastern point of Anglesey. Across the Menai Strait the snow covered peaks of the Snowdon Range are shrouded in a strange haze. Arriving in Beaumaris we do a few circuits looking for a good park for the car and eventually find one right next to the castle itself. 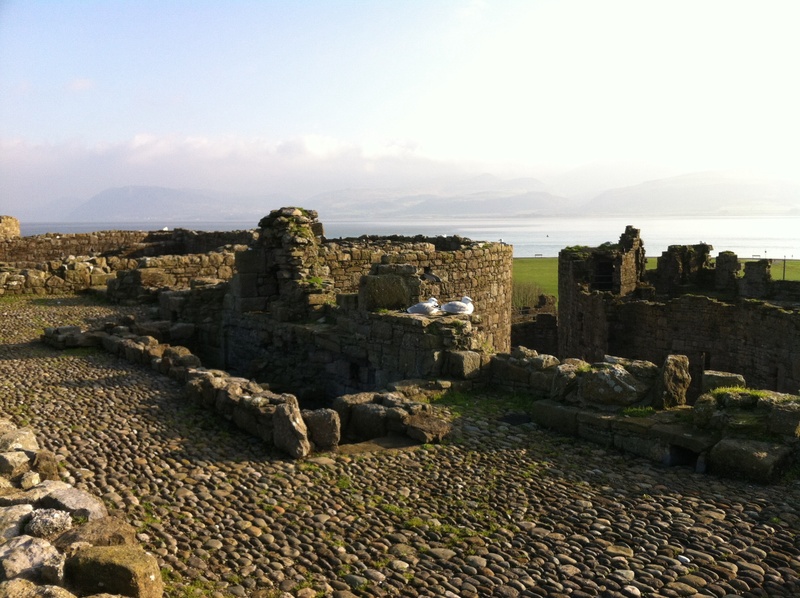 Beaumaris takes its name from Beau Marais which translates as ‘Beautiful Marsh’. 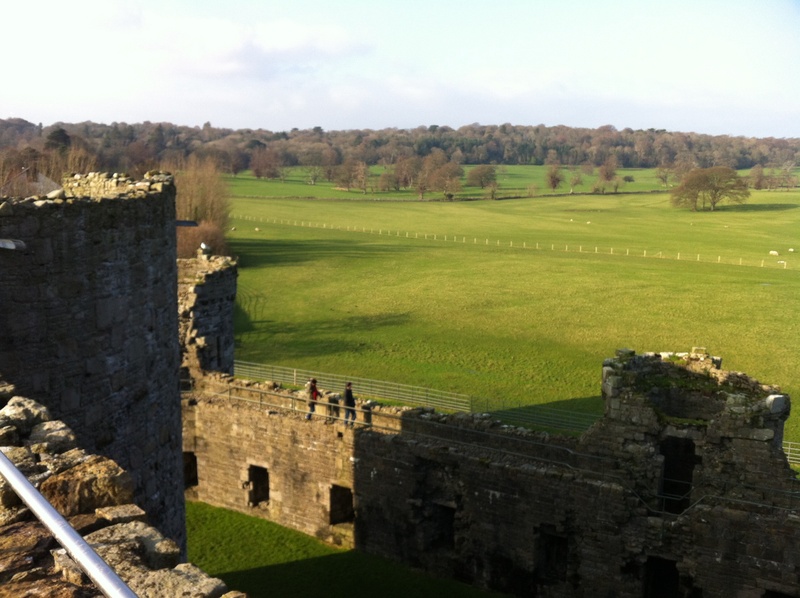 Guess this makes keeping the moat around the castle full an easy task. 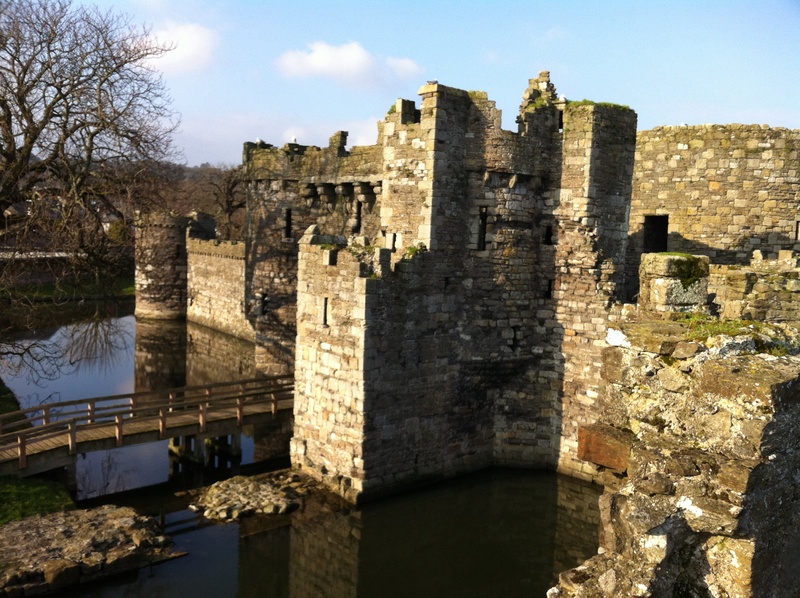 Construction on Beaumaris Castle was commenced in 1295 by King Edward the First however after thirty years was never fully completed. The concentric design by a Savoyard siege engineer was composed of walls within walls. 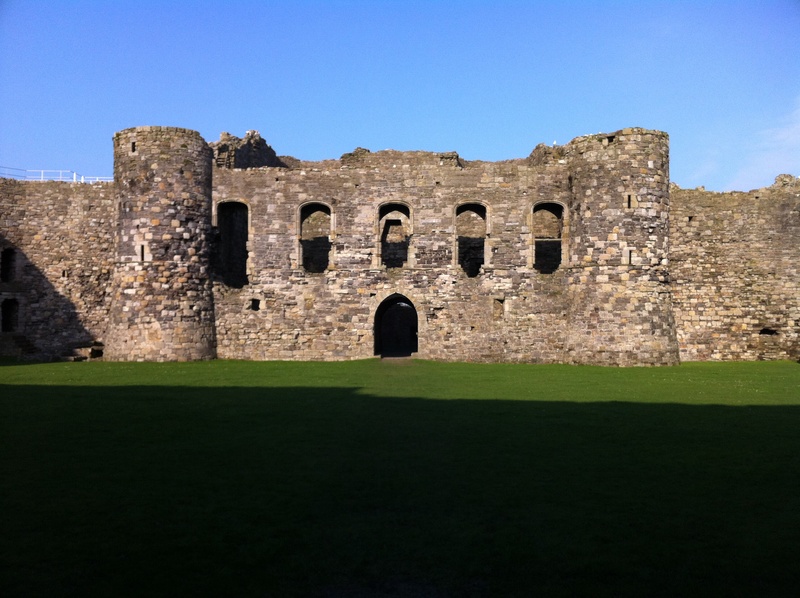 Towers and over 300 archery slots allowed a very effective defense and it was considered one of the best defensive designs of English Castles. 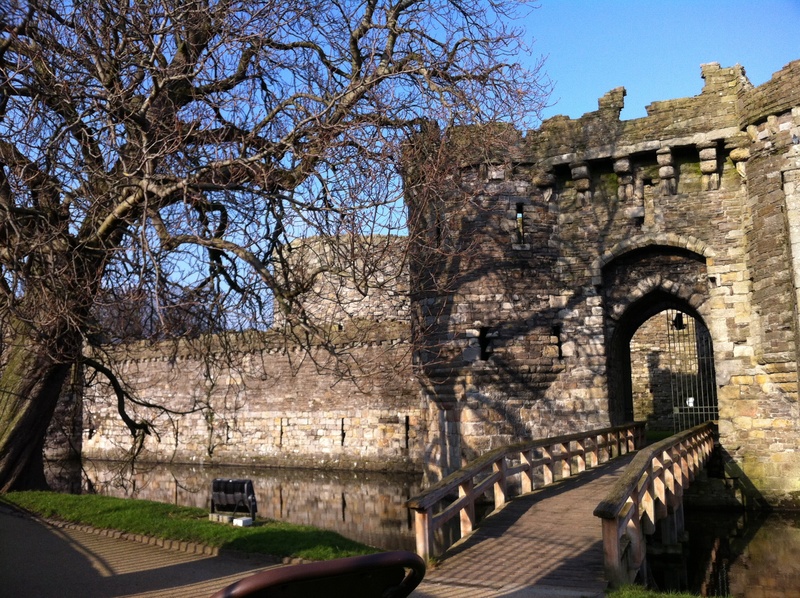 After paying the 4.50 pound each entry fee we enter the grounds outside the moat and walk towards the wooden bridge that crosses to the main castle gate. I am in full on shutterbug mode as is my custom these days. We cross the wooden bridge and pass through the arch of the first wall. 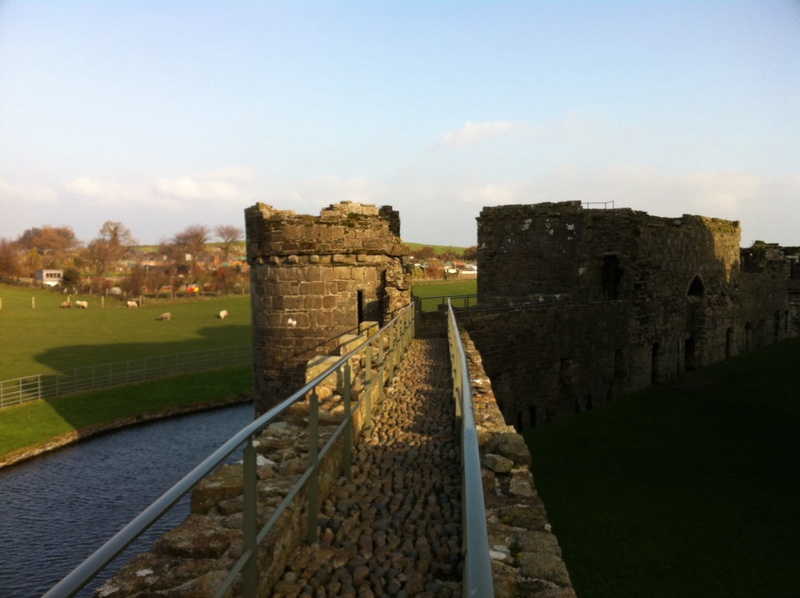 A narrow corkscrew stone staircase to our right gives us access to the wall top above which gives a great elevated view of the moat and bridge. Back at the base again we stride through the arch and window of the inner wall into the huge green expanse of the inner courtyard. Doors at each corner are accessed by low stairs however Pam’s attention is drawn by a person taking photos from the wall tops immediately opposite where we now stand. ‘How do we get there’ she asks and I set off to find an answer. To our left as we pass through the arch on the far side of the courtyard from where we initially entered stairs lead into the wall structure. From here another steep narrow stone corkscrew leads us to the top. A flax rope fixed to the stone walls by brass rings acts as a flexing handrail. At the top areas allowing walking are enclosed within modern stainless steel handrails. These shining modern accoutrements serve to highlight the ancient rounded stones that would once have been fully encased in the now centuries old mortar. Today their foot traffic polished tops are exposed by inexorable erosion from the elements and time. We make our way around the areas allowed by the stainless rails and descend the stone corkscrew at the far end. 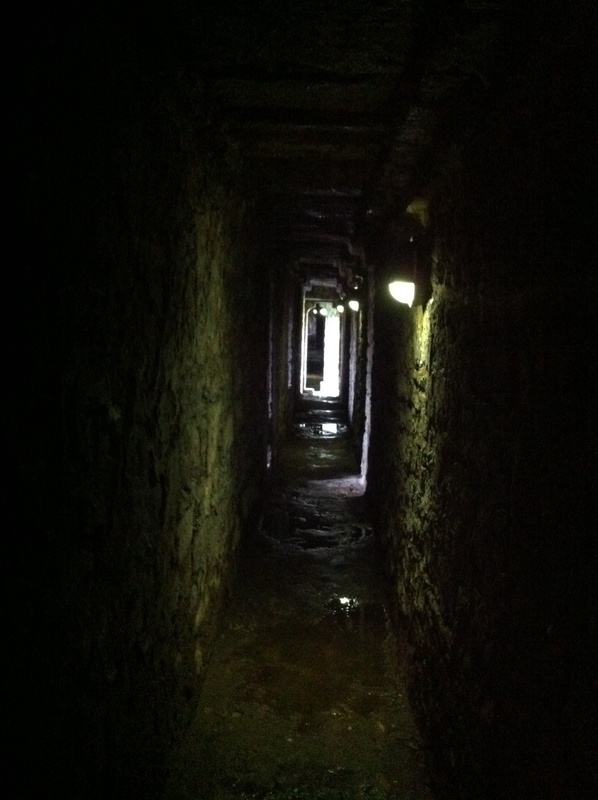 Halfway down a corridor within the walls branches from the staircase and we follow its dark interior. Small rooms built as hollows within the walls are accessed via this damp floored corridor. 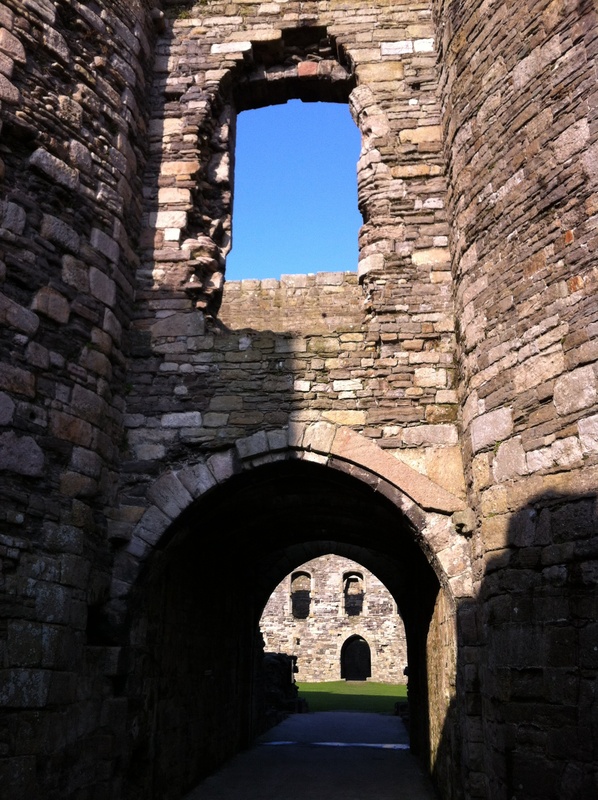 Thin slots serve as windows allowing views to both the central courtyard as well as the space between the inner and outer defensive walls of the castle. Obviously a series of corridors ran the length of all the main inner wall however the access to much of the remaining length and staircases has been blocked in an effort to maintain areas free of prying visitors. We retrace our steps through the inner gloom, descend the remaining stairs and burst into the bright green of the courtyard once more. Stairs that obviously lead to a similar corridor on the opposite wall from where we now stand draw our attention and we wander over to them. 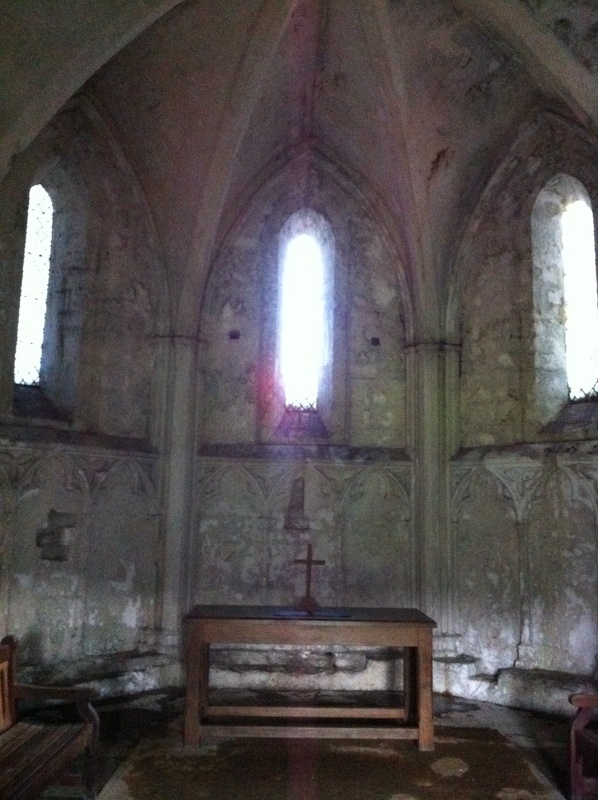 This time the inner corridor leads to a small dome roofed octagonal walled inner chapel. Acoustics within the dome are sublime, our whispers return as reverberant roars. A quaver hangs sustained glorious for seconds. Not for the first time I wish I was a more confident singer. Pam urges me to cut loose however we both remain silent. This is a space for sound beyond my meagre range nor would a rage filled growling poetry recital be appropriate here. 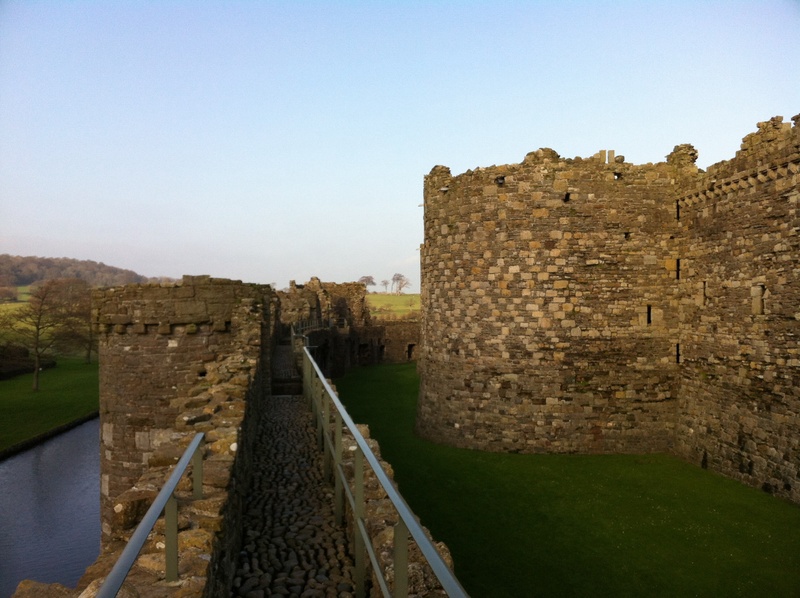 Out in the courtyard once more we head toward the outer walls climb a staircase to its top and walk the semi-circuit back along the Beaumaris town side of the outer wall. Blue skies that have drawn us out today are being covered rapidly by clouds coming in from the West. I do my best to take photos that maintain the fine day illusion for as long as we can.